Here’s another one of those shots of a brown bird in the hedge that turned out to be something other than a sparrow (apologies to all sparrows). 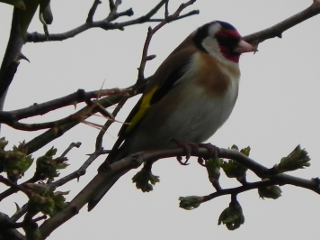 It looks like a goldfinch to me. Doesn’t something like this make you wonder about Eve O’Lution? You begin to suspect she was “just ‘avin’ a laugh” don’t you? And then you think about the human race – are we part of the joke? Of course from where we are we can’t see it, it doesn’t seem funny at all to us. Just like all Goldfinches seem normal to other goldfinches. What do goldfinches think about sparrows – or robins for instance? Do they wonder what possessed Eve to make a bird that looks that ridiculous? If the whole human race is the result of a practical joke – what’s the punch-line? Are we really that ludicrous? Sometimes it’s not hard to believe. There’s something about her sense of humour that makes me sure that Eve O’Lution is Irish.